So, I'm part of a team entering the UK Space Experiment Competition, and basically our proposal won out and is now one of six final proposals around the country! This is great stuff but we wanted to put on a display at a stand at a fair someplace, and for this we need something tangible! The actual proposal calls for a piece of light detecting kit that runs some £1500 and we certainly can't afford that, so instead I'm using a £0.50 light dependant resistor: pretty crude but works great! 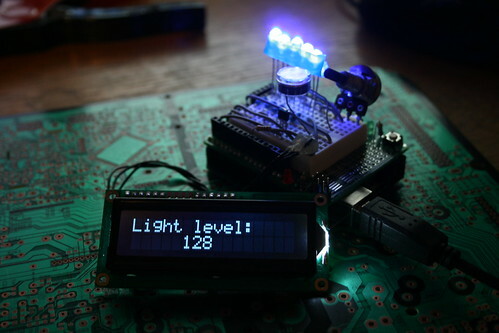 What's happening is the LEDs are being lit up, the Arduino reads the light level coming off the LDR and shows it on the LCD. 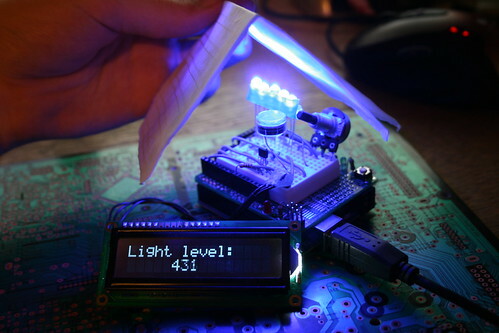 When you put your hand or a piece of paper over the LEDs, the light reflects down onto the LDR, increasing the light level! In space, the bits of dust act as the paper and you can detect a whole lot less light. The next step is vacuum forming a little case for the thing!